This spring 2019 Singing Frogs Farm is proud to continue our intensive, hands-on workshops to teach the science and mechanics behind our multi-award winning, no-till, agroecological, intensive and profitable farming methods. Build your ecology, both above and below ground. Learn how to farm with (and for) Mother Nature. Understand how, in using these natural systems, you too can increase your soil organic matter, crop nutrient density and overall productivity. We are offering three intensive, single-day workshops this autumn. Want to come in autumn? We’ll have more workshops in September and October as well. Workshops will run from 9:00 am until 4:00 pm with a 30 minute lunch. We’ll spend an intensive day in the fields and send you home with new knowledge, skills and techniques for soil building, carbon farming and enhanced production as well as a dozen pages of notes on some of the nitty gritty details of our unique farming system. Please bring your own lunch. We will provide coffee, tea, and veggies from the farm for you to snack on, but please come prepared with food to fuel you through the day. Tools will be supplied. Please dress appropriately including boots, hats or gloves if desired, and a water bottle. We will be working. Cost of the workshop is $345. The fee includes $50 towards our scholarship program for farmers with a financial barrier. If the price of the workshop is an absolute barrier to your participation, please get in touch with us at info@singingfrogsfarm.com and use the subject heading “Workshops, Spring 2019”. 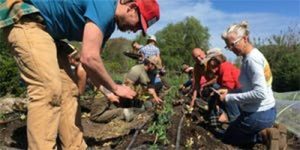 New this Spring, we’re offering an opportunity for 1-2 beginning farmers per workshop to have an extended learning experience. For one to three full days post workshop you will work alongside our farm crew to gain more experience and insights into bed-preparation, harvest, seeding and more. We are opening this experience for those who have at least one year of production farm experience and are currently operating, or have firm plans to begin, their own farm. Apply with a brief description of your background and interest via email to info@singingfrogsfarm.com using the subject heading “Beginning Farmer Extended Intensive”.